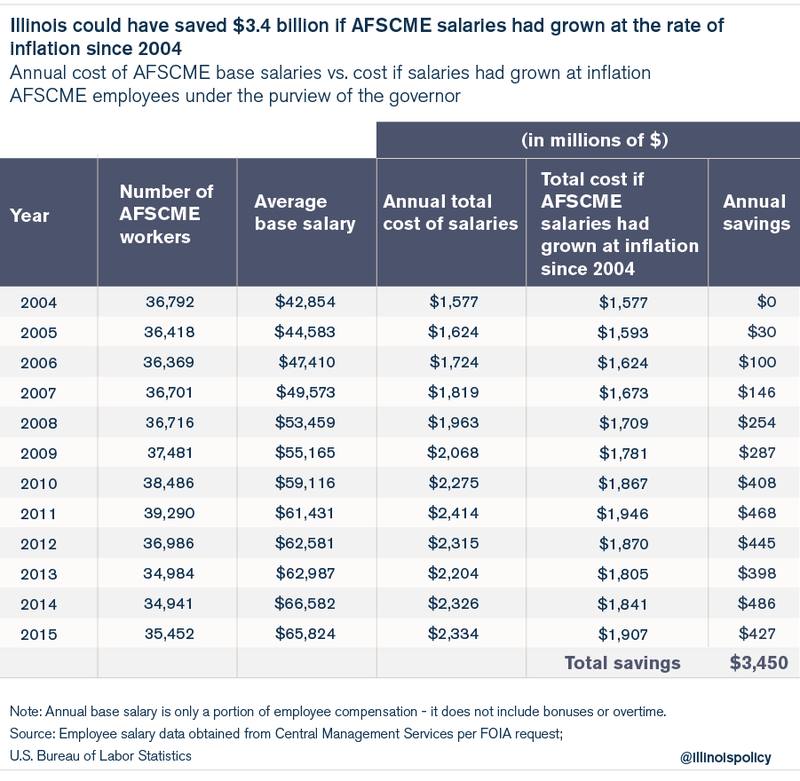 Illinois could have saved a cumulative $3.5 billion had AFSCME salaries simply grown at the rate of inflation since 2004. Contract negotiations between Illinois Gov. Bruce Rauner and the American Federation of State, County and Municipal Employees nearly reached an impasse last week. The governor’s office and AFSCME have been in talks for nearly a year to replace the most recent contract, which expired at the end of June 2015. These talks are ongoing despite the union’s assertion Jan. 8 that negotiations had fallen through. Reaching an affordable agreement with AFSCME is imperative for the state, given that AFSCME worker salaries grew five times faster than Illinois workers’ earnings from 2005 to 2014, costing Illinois taxpayers $3.5 billion. AFSCME continues to posture for better terms despite a projected $4 billion state budget shortfall, billions in unpaid bills and the collapsing credit rating of the state. The union refuses to accept any reforms even though 17 other unions, including the Teamsters, have already reached compromises with the governor and accepted wage freezes and other key reforms, including merit pay. Rauner is right to pursue both salary and health care reforms in negotiations with AFSCME. According to a memo the governor’s office released in 2015, AFSCME’s leaders were pushing for four-year raises ranging from 11.5 to 29 percent – which would push up salary and pension costs by $1.6 billion – a 37.5-hour workweek, five weeks of vacation and enhanced health care coverage. A more recent release from the governor’s office shows the rejection by AFSCME of the majority of the governor’s proposals. But a look at base salaries for AFSCME employees over the past decade shows why a salary freeze is needed to bring the state budget back in line with what taxpayers can afford. 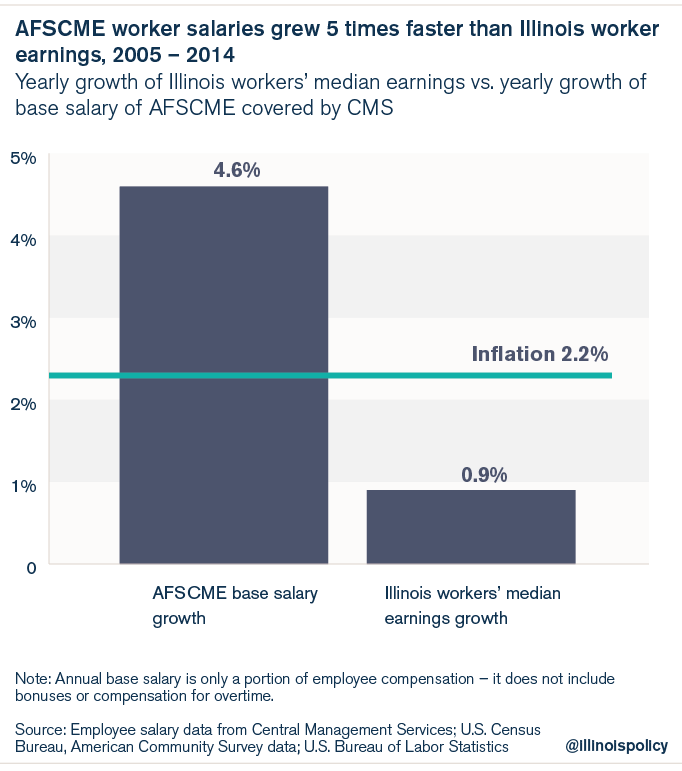 According to a response from the Illinois Department of Central Management Services to a Freedom of Information Act request, AFSCME salaries have risen at twice the rate of inflation since 2004 and five times faster than Illinois worker earnings. That growth rate has put pressure on Illinois’ budget year after year. The state could have saved a cumulative $3.5 billion had AFSCME salaries simply grown at the rate of inflation since 2004. The budget impact in 2015 alone would have been more than $425 million. This is a low-end estimate of what could have been saved. The savings calculations are based only on base salary and not on other forms of compensation such as overtime. There is also the potential for hundreds of millions in health care savings. Any health care reforms the governor accomplishes with AFSCME will have far-reaching effects because the agreement is usually used as a model for the state’s other labor agreements. More than 230,000 active state workers and their dependents get their health insurance through the State Employee Group Insurance Plan, or SEGIP. State-government employees are provided generous health insurance plans – often with no deductibles – and contribute only a small share toward that coverage. Even before accounting for the fact that the state health insurance plans are some of the most generous available, these state-government workers pay a far smaller share for superior coverage than their private-sector neighbors. With the state in such a financial crisis and AFSCME benefits far more lavish than those in the private sector, Rauner has an obligation to align the cost of government with what taxpayers can afford.